All aboard! The best way to experience the breathtaking western Canadian wilderness is to take a Canadian Rockies Train Tour. If you want a hassle-free train trip where you barely have to lift a finger, Rocky Mountaineer’s Canadian Rockies Train Tours are for you. With several options to choose from, you won’t go wrong. We have several service options for guests with varying budgets, but regardless of what you choose, you are guaranteed to experience the spectacular beauty of the Canadian Rockies. We offer both day and night passenger trips. The Rocky Mountainteer is the only train that travels between Vancouver and Banff National Park, and Vancouver and Calgary, in both directions. We have several multi-day train packages available! Rocky Mountaineer train packages combine Canadian Rockies train trips with hotel stays and activities in your chosen Canadian Rockies destinations. Transfers and transportation are available to link everything into a seamless, hassle-free experience. 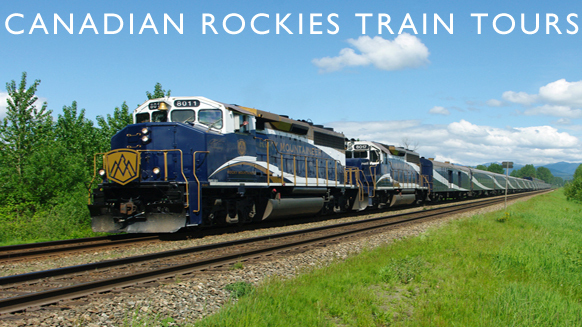 See a detailed list of our packages to see what Canadian Rockies train tours work for you. What’s Available on my Canadian Rockies Train Tour? We offer three levels of service on our Canadian Rockies Train Tours. RedLeaf: A traditional service that includes picture windows, a cold breakfast and a lunch. SilverLeaf: A single-level dome car with two-thirds more viewing area. This service also includes a hot breakfast and a lunch. GoldLeaf: A two-dome car with a specially-prepared breakfast & lunch in the dining car. Popular hotels are available for our RedLeaf and SilverLeaf guests, while Fairmont Hotels (and other deluxe hotels) are reserved for the GoldLeaf Service. Rocky Mountaineer packages also offer several transportation options: bus tours and transfers are available with all packages. For those traveling in groups, there are private transportation options available. Book your Canadian Rockies Train Tour Today! Don’t delay! Choose the Canadian Rockies train tour package that’s perfect for you and enhance your vacation to Banff, Jasper, Lake Louise or other destinations in the Canadian Rockies! Prepare for your awesome Canadian Rockies Train Tour today by watching this video!